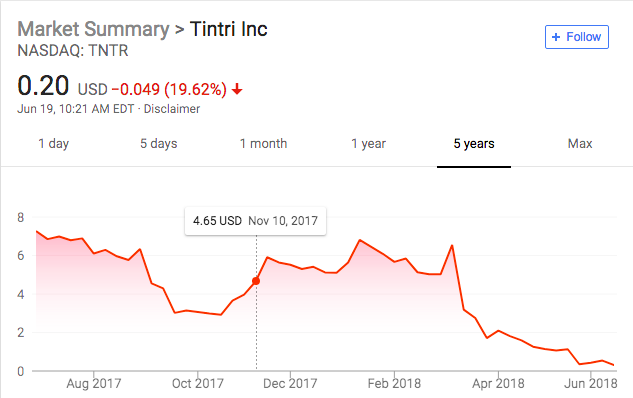 Tintri Inc., a publicly-traded ($TNTR) Delaware-incorporated and Mountain View California based provider of enterprise cloud and all-flash and hybrid storage systems appears to be on the brink of bankruptcy. There's no way any strategic buyer agrees to buy this thing without a 363 comfort order. "The company is currently in breach of certain covenants under its credit facilities and likely does not have sufficient liquidity to continue its operations beyond June 30, 2018." "Based on the company’s current cash projections, and regardless of whether its lenders were to choose to accelerate the repayment of the company’s indebtedness under its credit facilities, the company likely does not have sufficient liquidity to continue its operations beyond June 30, 2018. The company continues to evaluate its strategic options, including a sale of the company. Even if the company is able to secure a strategic transaction, there is a significant possibility that the company may file for bankruptcy protection, which could result in a complete loss of shareholders’ investment." Nothing like a $7 launch, a slight post-IPO uptick, and then a crash and burn. This should be a warning sign for anyone taking a look at Domo — another company that looks like it is exploring an IPO for liquidity to stay afloat. But we digress. The company's capital structure consists of a $15.4mm '19 revolving credit facility with Silicon Valley Bank, a $50mm '19 facility with TriplePoint Capital LLC, and $25mm of 8% convertible notes. Revenues increased YOY from $86mm in fiscal 2016 to $125.1mm in fiscal 2017 to $125.9mm in fiscal 2018. The net loss, however, also moved up and right: from $101mm to $105.8mm to $157.7mm. The company clearly has a liquidity ("net cash") covenant issue (remember those?). Accordingly, the company fired 20% of its global workforce (~90 people) in March (a follow-on to a 10% reduction in Q3 '17). The venture capital firms that funded the company — Lightspeed Venture Partners among them — appear to be long gone. Silver Lake Group LLC and NEA Management Company LLC, unfortunately, are not; they still own a good amount of the company. "Isn't cloud storage supposed to be all the rage," you ask? Yeah, sure, but these guys seem to generate product revenue largely from sales of all-flash and hybrid storage systems (and stand-alone software licenses). They're mainly in the "intensely competitive IT infrastructure market," sparring with the likes of Dell EMC, IBM and VMware. So, yeah, good luck with that.